No, I haven’t taken up gambling, honest! Though self publishing can be a scary process that can feel a little like that is exactly what it is. I have often been curious why having a bet on a horse is going to send you down the Bookmakers, and it seems to have something to do with those that keep the books on Who bet How Much, on What, When, and in a bizarre kind of a way producing a book to sell has at least one of those elements; how many books to make, to cover costs and yet still make a living, and, in my case, raise funds towards publishing the paperback storybook whose production will be the final stage in this journey of mine. 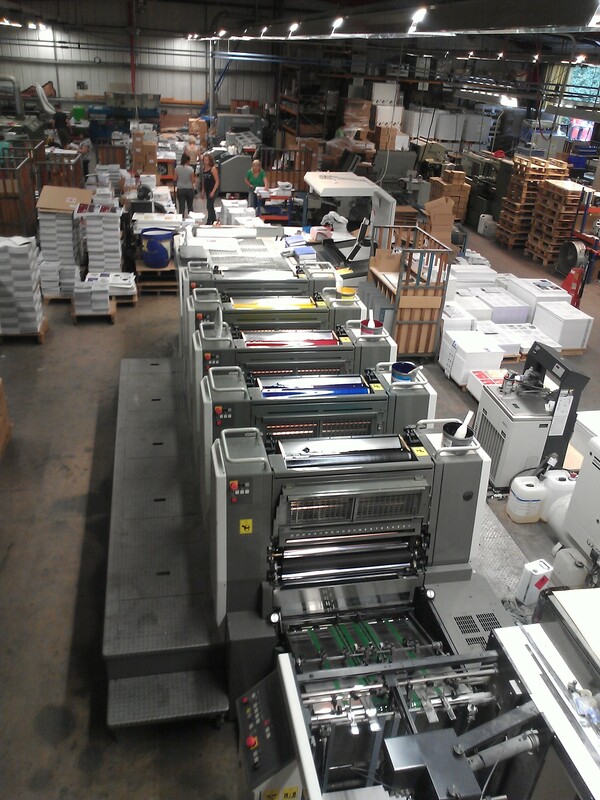 My visit to Exeter Short Run Press, the small family run local business who are going to make the limited edition version of my book was one of the final steps in getting the cover design ready. The limited edition version of my book is to be as true a copy of the first edition as possible; that meant taking in a copy of an original with its felt cover and leather spine to be scanned. Whilst I was there I seized upon the opportunity for a guided tour of the place where my book is being produced in time for the launch next Saturday (the 19th). 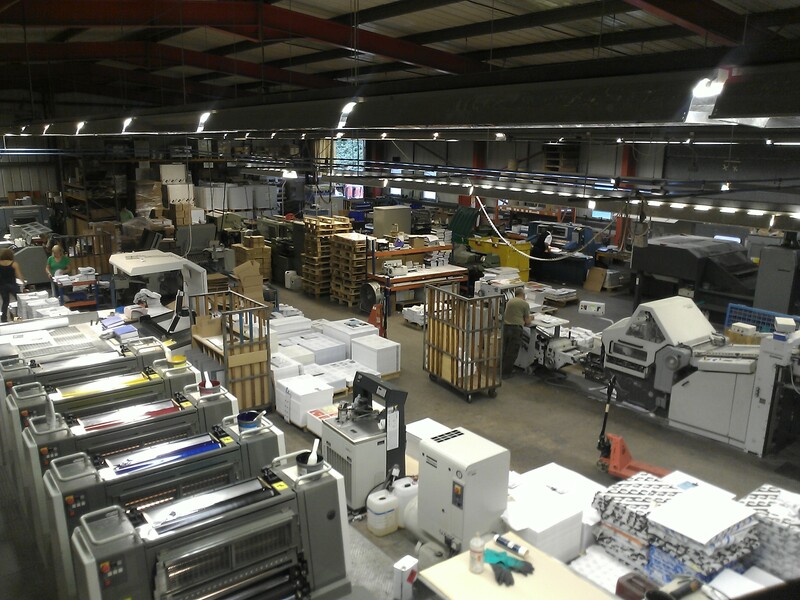 Exeter Short Run Press are Book Printers and Binders, but now that I have seen them in action I can say very truthfully that they are indeed Makers of Books! I had no notion, when I embarked upon this journey of mine, to walk around the land of my birth, hearing, collecting and telling the tales of a people in transition, that four years on I would be overseeing the making of a book I had written, and that the journey I had dreamt into being as the days darkened into winter in 2009 was as yet nowhere near completion. Exeter Short Run Press hang out in an industrial estate with modern bright clean offices upstairs and a large production floor downstairs. I am taken downstairs to see all the different processes my manuscript will go through to become a finished book. There has been a lot of too -ing and fro-ing of the manuscript. I have learnt that no matter how many people proof read, no matter how often you yourself proofread, you are still going to be finding errors right up to the last minute, yet another comma in the wrong place, an extra space between words, and even a final phrase that never did sound quite right, finally settling into new configuration of words. I want it to be something special, this edition, it’s a celebration of all those wonderful people who contributed to the story of my long walk. Each and every person is mentioned somewhere, if not in the text then in the thank you’s at the back. These people are history in the making and this hardback cloth bound volume is an appreciation of that. Of course the first edition is that too; but out of reach cost wise for many, hence the decision to create a similar volume for half the price. It is still going to be pretty special, hard backed, cloth bound, the same quality recycled paper (the beautiful 5 Seasons, which for me is reminiscent of the paper used in books of bygone days, a celebration of the past, our roots), the same carefully chosen mango coloured endpapers, and the same beautiful story of some of the heroes of Our Times. I think to myself. There is something about seeing something large scale that can help us to grasp the intricacies of processes initially to complex for us to comprehend. I am reminded of those large building blocks that young children are given as a precursor to lego, and perhaps one day, for some, to real bricks. The colour printer is enormous. Noisy too, though it is the cumulative effect of the several machines that contributes to the persistence of noise throughout the ground floor of the premises. Simon takes me to visit each machine in turn, introducing me to the operators, who seem proud of their abilities to manage these large mechanical devices whose processes can now be refined further still by keying in the right commands on their little computer screens. There is a fondness for the machines, a loving appreciation for what they do and for how the paper must be inserted in order for them to produce their best, and a caring over the things that might irritate their machine, cause it to get something wrong. I am reminded of people with large pets who are wonderfully agile and magnificent when running free and yet needing very precise care indoors if they are not to knock vases flying with wagging tails or bury bones under rugs. There is a kind of circuit running around the room that new manuscripts must follow if they are to be transformed. It’s a well trodden circuit, and though I find it hard to pick out the route, the people who manage the machines are intimate with each and every step; some having become expert with a particular device. Take the sewing machine, for example. 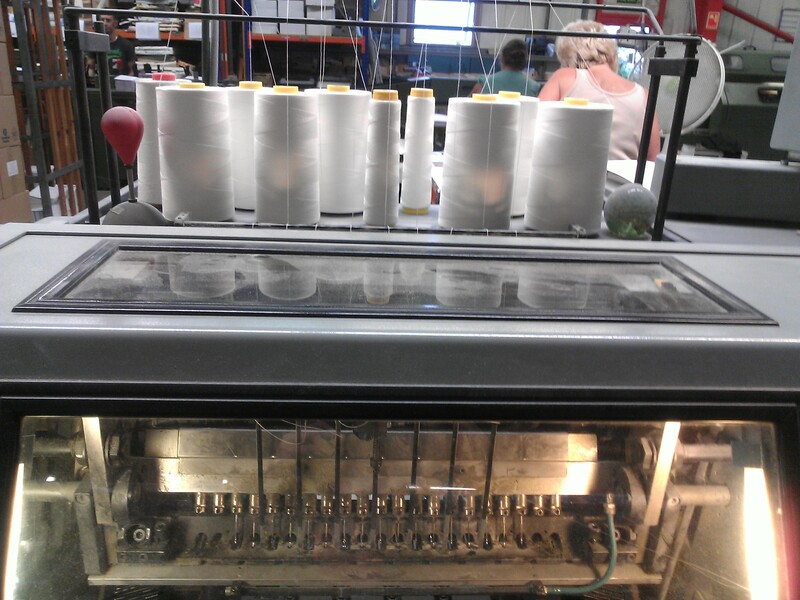 Its lady guardian carefully lines up paper to have tiny holes punched through it ready for the needles to begin their stitching. She’s been feeding machines like this one for 20 years she says with pride, and Simon, my book’s young designer, looks on with respect. Then he shows me the stapler. This too is on a massive scale when you consider your desk top stapler. It runs off huge reels of wire that it knows exactly how to cut into staple size pieces it can punch through pamphlets and thin children’s storybooks. 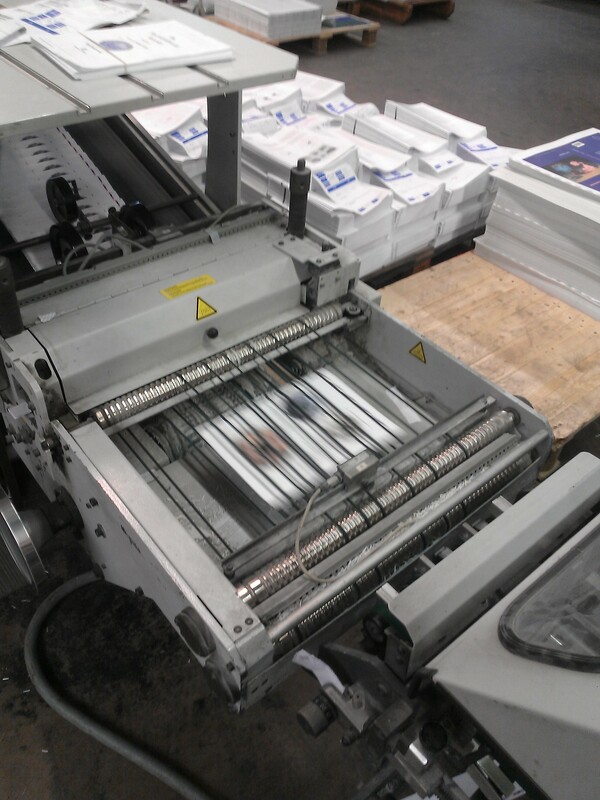 The folding machine takes in massive sheets of paper with seemingly disparate pages on it. Its male operator works with the patience and care you might see from a gardener with his seeds. 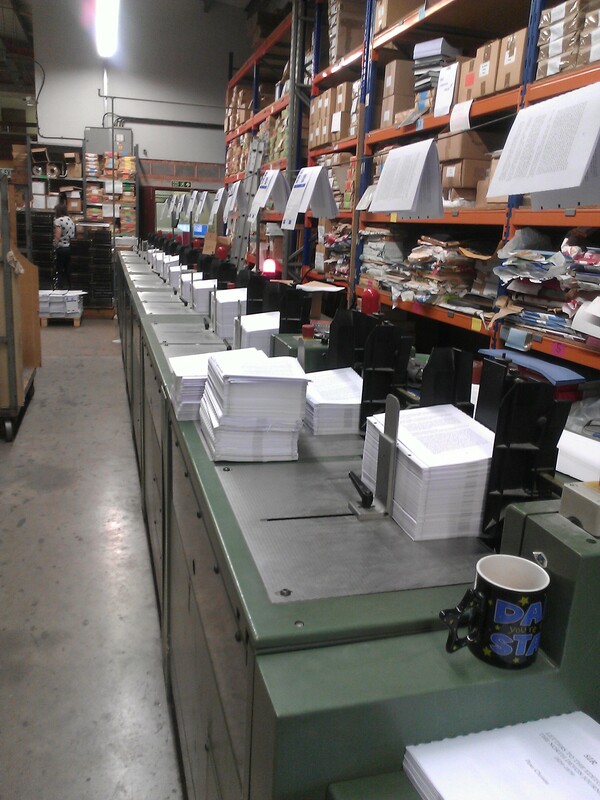 Several seconds after loading the other end of the machine shoots out perfectly folded A4 size sheets all beautifully stacked in section sized piles. Over by the sectioning machine one of the firm’s partners, Matt, is overseeing the insertion of pieces of manuscript in order so that the sections will come out as a cover less book. Everything must be fed in exactly right. It’s the old office or staff room photocopier jam nightmare on a huge scale. There is a machine that takes in the prepared covers, the glossy front attached to stiff cardboard inserts that will form the spine, the front and back covers, and then glues them to the pages of a book, already assembled from its put together sections. Then there is the massive guillotine computer operated by a young man. Simon points out all the safety devices installed on this machine to prevent accidents. Once a manuscript is looking like a book it still needs trimming down to be the right size for its cover. I ask Mark Couch, company partner who has delivered me safely back in to the city centre for my journey home, how long it will take the machines and their loving operators to make my book. It isn’t financially viable to produce one set of books at a time, the machines must be occupied once they are switched on, so it isn’t a straight forward question I have asked, but if it were to be the process of my book alone that were to be followed then it would be a journey of three days through the circuit. As with all things a thing of quality cannot be rushed. If it were, ink from previous pages would remain on rollers and produce staining on subsequent pages. If it were, pages would stick together and text be missing, rather than the delicate process of air blowing sheets of paper apart before it enters a machine’s process. If it were, the glue would not have time to set, binding the book properly so that it won’t come unstuck once the book is opened and the spine stretched. My visit to the Book Makers leaves me both exhilarated and pensive. The thought of what those machines, unchanged from the seventies in mechanical process, just the addition of computer precision over human brain calculations, are doing in order to deliver me of 200 hardback copies of my writing, is awe invoking. The thought of that machine room noisy with the constant hum of whirring mechanics, and the operators spending their 9-5s down there takes me on a little journey through to the pages in my book that describe the life of the Lancashire weavers, the tales my father told of lifetimes of poverty, comradeship, and the deafening noise in the weaving shops, and soon to modern day eastern sweat shops mass producing cheap goods for our consumption. I have chosen locally made, local craftsmanship, local materials, wherever I have had a choice, and learnt the true cost of such choices. Yet even here, I see that it is only with the aid of oil driven machinery that enough of my books can be made in time. It really isn’t so very long ago that a book was a thing of the wealthy, and that an ordinary family may, if they were lucky, have owned and treasured one family bible. I feel myself situated in my times, these times, the Age of Transition; what choices are we making to honour our roots, to honour our sense of the equal value of each and every contribution, to create a society we are proud to be a part of?